Bill Price, owner of Classic Wines and Price Family Vineyards, along with Santa Barbara County winemaker Gavin Chanin, have launched a new Pinot Noir and Chardonnay label. 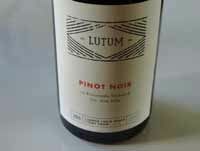 LUTUM is Latin for “dirt” or “soil” and references the partner’s mission to make wines that reflect the great vineyards of California. The first wines were released from the 2011 vintage and available through a mailing list offering. The inaugural wines include a 2011 Durell Vineyard Sonoma Coast Pinot Noir ($60) and a 2011 La Rinconada Vineyard Sta. Rita Hills Pinot Noir ($50). Chardonnay will be added to the lineup beginning with the 2012 vintage, as well as additional vineyard sources including Bien Nacido, Gap’s Crown and Sanford & Benedict vineyards. Price, who owns part of the Durell Vineyard, the Gap’s Crown Vineyard and ownership interests in Three Sticks, Kistler, Kosta Browne and Gary Farrell wineries, was so impressed with Chanin’s winemaking talent and philosophical focus at such a young age (Chanin is 27-years-old), Price asked him to partner in a winery. Chanin was previously an assistant winemaker at Qupé and Au Bon Climat and has his own label, Chanin Wine Co. The wines are crafted at LUTUM’s new winery in Lompoc. Bill Price and Gavin Chanin announced in February 2019 that their partnership was transitioning to a close. They each decided to focus on their own eponymous brands - Bill with Three Sticks Wines and Gavin with Chanin Wine Co. 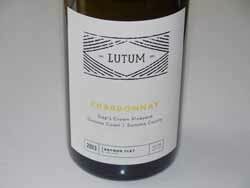 The same vineyard designates that were produced with Lutum will still be available between the two projects. The last stock of Lutum wines was sold starting on February 28, 2019.